Dress the little ones in Grandloving style with "I'm a Grandlover" 100% cuddly cotton onesies and T-shirts. Each item is $14.95, plus $4.50 s&h for 1 item, or $6.00 s&h for two items. You can order using our mail-in order form, or use PayPal and your credit card (see below). Any questions -- just call 804-462-0884 or e-mail us. 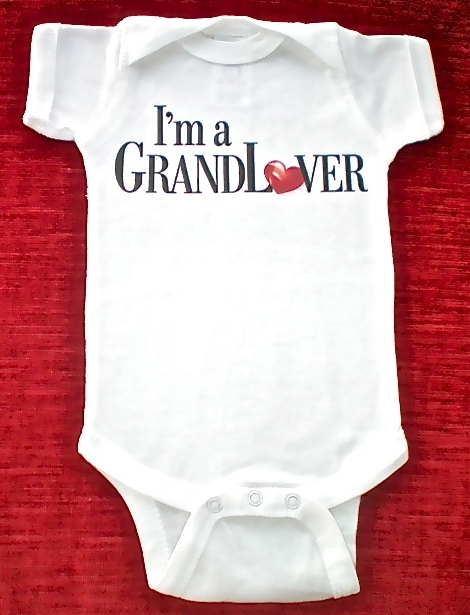 Dress the little ones in Grandloving style with "I'm a Grandlover" 100% cuddly cotton onesies. Sizes newborn, 6 month, 12 month, 18 month and 24 month retail for $14.95, plus $4.50 shipping & handling ($6.00 s&h for 2 onesies). 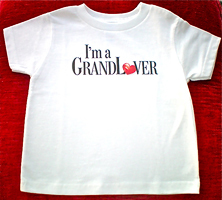 These "I'm a Grandlover" 100% cotton t-shirts are sure to bring a smile. Sizes 2T, 3T and 4T retail for $14.95, plus $4.50 shipping & handling ($6.00 s&h for 2 shirts). 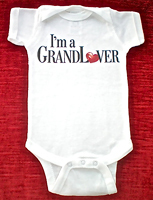 Our Promise: We think you'll love Grandloving onesies and t-shirts, but if you're not completely satisfied, just return the items in original condition within 10 days and we'll refund your purchase price.